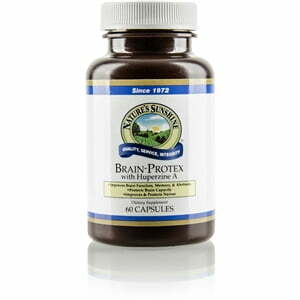 Nature’s Sunshine Brain-Protex with Huperzine A protects the brain and fights against free radicals. 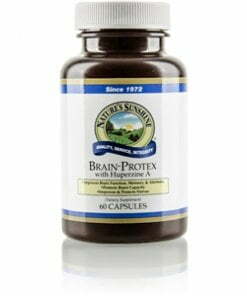 The blend of herbs included in Brain-Protex assist in memory retention, mental alertness, and nerve function. Included in the formula is ginkgo biloba, an herb that enhances circulation to the brain and huperzine A, an extract of Chinese club moss that may strengthen memory retention. Brain-Protex also includes phosphatidyl serine, choline, ethanolamine, inositol, and rhododendron caucasicum, all powerful protectors of the brain. Instructions: Take two capsules with a meal twice daily. Drink one glass (8 ounces) of water with the capsules. Maltodextrin, magnesium silicate, magnesium stearate (vegetable), silicon dioxide (powdered silica), cellulose (plant fiber), gelatin, and water.